Figure 1. Next Biweekly Payday from Date. Let’s say we seek to determine the next payday in a biweekly payday schedule – with Friday as the assumed payday- we are going to make use of a formula which is obtained from the Excel CEILING function. 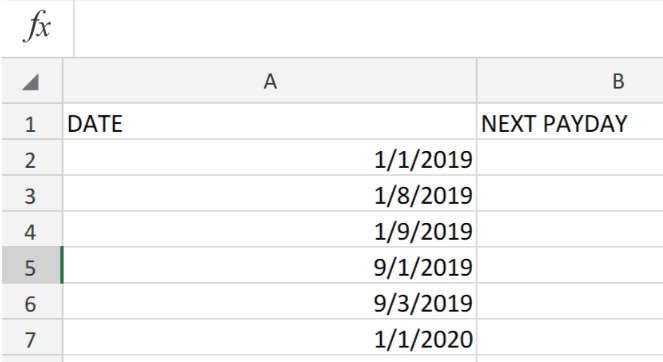 The first day in Excel’s default 1900 date system is the number 1 (which corresponds to the date Sunday January 1, 1900, in Excel). How to use the CEILING Function in Excel. The CEILING Function in Excel operates by rounding up numbers to a specific multiple. Enter all of the biweekly payment dates available to us in appropriately labeled columns in our worksheet. Be sure to leave a few cells blank for Excel to return the next payday. Figure 2. Next Biweekly Payday from Date in Excel. Figure 3. Next Biweekly Payday from Date in Excel. 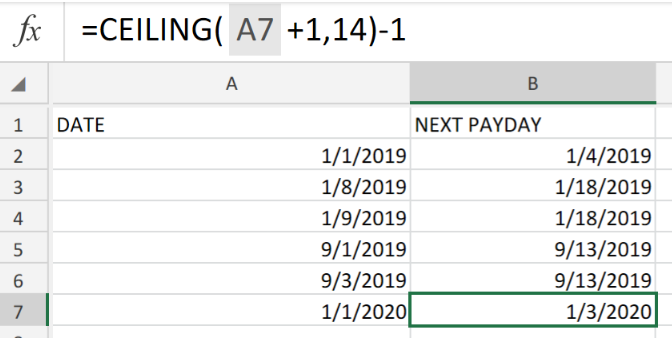 The Excel CEILING Function was able to return 4/1/2019 as the next payday after 1/1/2019. Modify the formula in cell B2 and copy into the other cells in the NEXT PAYDAY column to get the desired results. Figure 4. Next Biweekly Payday from Date in Excel. In the 1900 date default Excel system, day number 6 is the first Friday, day number 13 is the second Friday, and the second Saturday is day number 14. This simply means that henceforth, every second Saturday in the month are divisible by 14. I have a pivot table with employee payroll data in an excel sheet (excel 2016). I need to automatically link another sheet called OUTPUT with data headers only. The pivot table has 84 rows but this can vary for each payday so the OUTPUT table needs to link up automatically to show the new data each payday. The OUTPUT table has other headers the data for which I source from other sheets eg employee address and tax file number etc. An Excelchat Expert solved this problem in 17 mins!